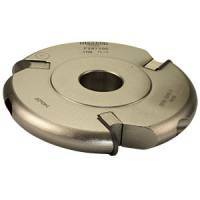 A range of straight fluted solid tungsten carbide cutters specially ground for cutting acrylic. The polished flute design allows for smooth feed rate, efficient chip clearance and a cleaner finish. Single flute solid carbide cutters offer fast cutting and are especially suited to cutting low melting point plastics. The design of two flute cutters gives reduced contact with the material, plus gradual lead-in when first cutting and is the perfect preparation before flame polishing of Perspex.